Fractal Zoomer is a lightweight application which enables you to render a wide variety of popular fractal functions. The utility is packed with multiple options which will considerably enhance your fractal rendering experience. Moreover, the program is very easy to use and installation is not required. The application requires Java 1.8 or newer installed on your computer. 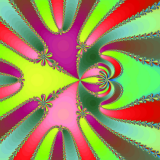 Fractal Zoomer is able to render more than 120 fractal functions. Moreover, the program features various color options, plane transformations, orbit tracking, image filters, user formulas, domain coloring, Julia Map, 3D Heightmap, Julia sets, and much more. Fractal Zoomer includes a powerful boundary tracing algorithm which will accelerate the calculations. Polar coordinates projection is available as well. The program includes a series of user-compilable functions. The application is able to render more than 120 fractal functions. Fractal Zoomer has been tested by Download82.com team against viruses, spyware, adware, trojan, backdoors and was found to be 100% clean. Our editors will recheck this software periodically to assure that it remains clean.